This patient had a chief complaint of developing a bump around her tooth about 1 1/2 years after the root canal. She had the root canal performed by her general dentist, and on the periapical x-ray, the root canal appears to be well done. Upon clinical evaluation, I found the tooth to have pain to tapping and biting. The preoperative x-ray is shown in image #1. Using 3-D Cone Beam technology, I was able to identify the source of her discomfort – there was a missed DB root that was not treated during the original root canal, shown in image #2. Image #3 is an axial slice that outlines the missed DB root. Without the Cone Beam imaging it is difficult to see the untreated anatomy that was causing the patient discomfort. The additional root could not be seen in the traditional x-ray, but it is clear and definitive in the 3-D image. Image #4 is the coronal view of the cone beam, that is outlining the “shadow” around the DB root. This shows the bone resorption around the root that occurs as a result of the tooth infection. This image also shows the changes in the the maxillary sinus as a result of the tooth infection. 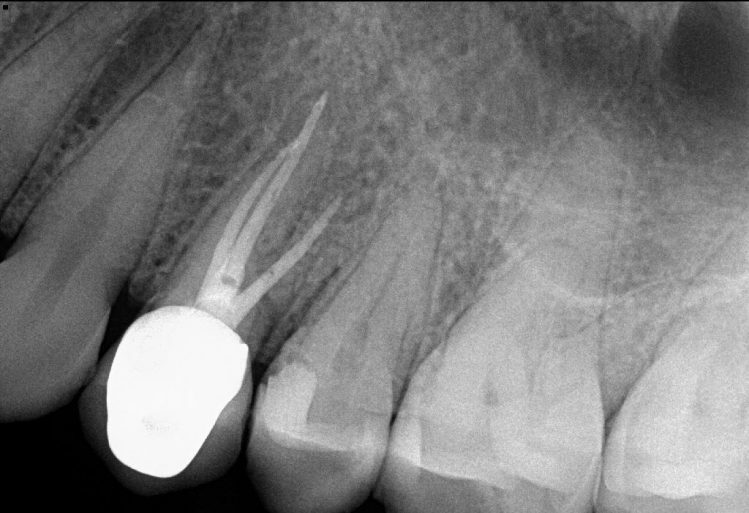 Both the “shadow” and the sinus membrane thickening will resolve after proper root canal therapy. Image #5 shows a working file in the DB root identifying its correct location and length. Image #6 is the conefit x-ray, after all the canals were cleaned and refilled. The final filling and obturation of the root canal. The crown is intact and also sealed with a white esthetic restoration that conceals our access into the crown. Knowing your anatomy is key! The likelihood of 3 roots on an upper premolar is 6%. Remember, for a root canal to be successful, you have to FIND every canal, and get to the END of every canal.